The eternity of the element air. Gentle and refined, yet the strength of the wind it is able to erode even the toughest of materials giving birth to distinctive shapes known in nature. 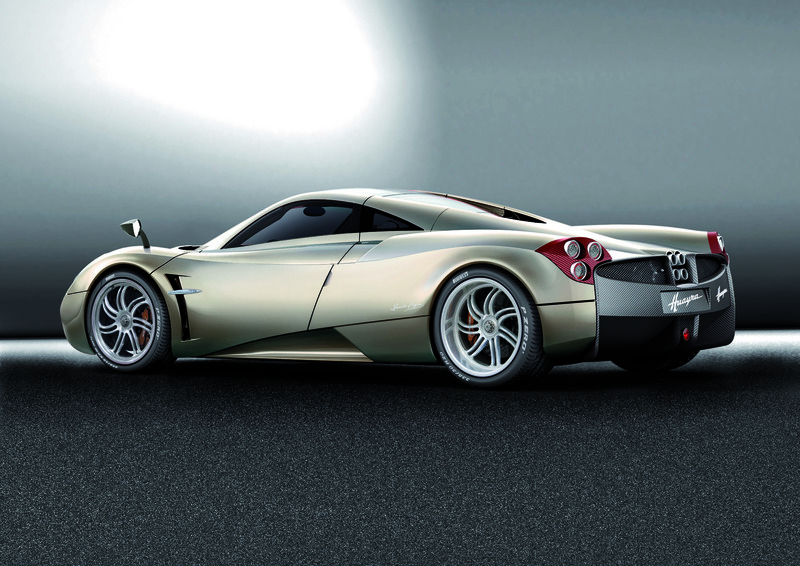 Elegant and muscular the Huayra merges the past, present and future in a timeless interpretation of automotive art. The styling of the car was perfected over the course of 5 years to find each line's beginning and end. During this study, eight scale models were created, as well as two 1:1 models, each an evolution of the previous in a never ending quest to perfect the form and refining the substance. The bi-xenon headlamps are just one of the many precious gifts from the Zonda R, and LED daytime running lights are seamlessly integrated in the elliptical shape of the design. The rear bumper integrates with the diffuser and is dominated by an elliptical frame that surrounds the four central exhaust outlets, now becoming a characteristic Pagani element. 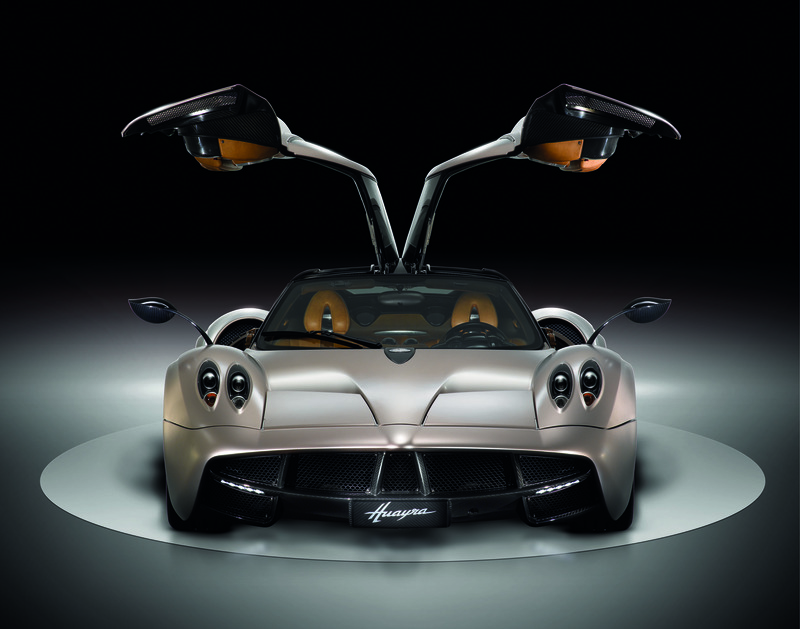 The new central monocoque on the Huayra is an entirely new design made from carbontitanium. 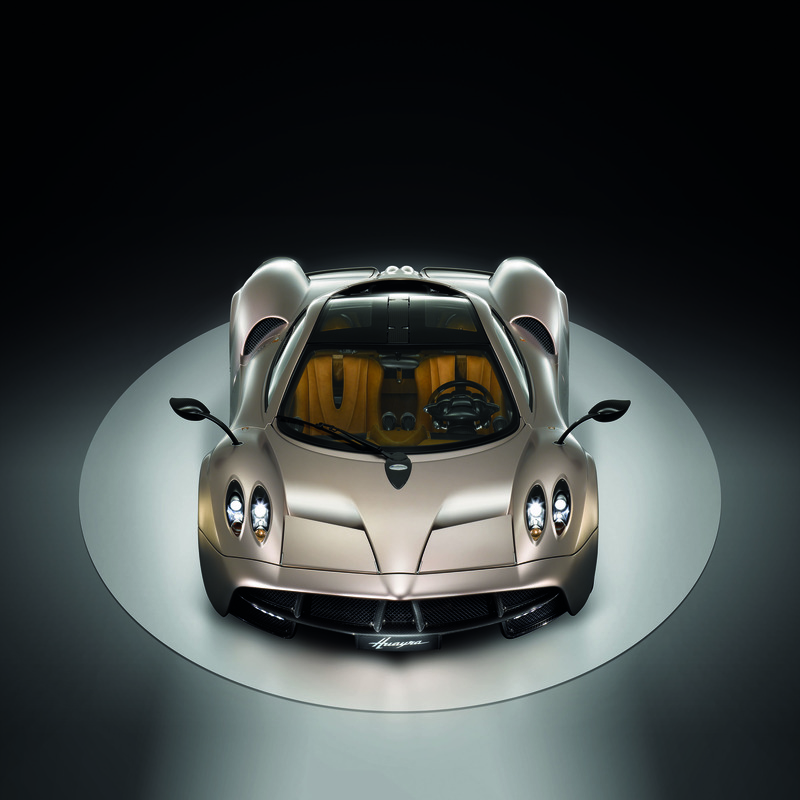 However, with the gull wing doors cutting deep into the roof, much research was focused on achieving the highest levels of rigidity through the application of new advanced composite materials and technologies first tested on the Zonda R. The fuel tank is located integrally in the best protected area of the monocoque, behind the driver, reinforced by safety cell made of different composite and ballistic materials. The front and rear CrMo subframe soffer an exceptional rigidity-to-weight ratio to allowing the suspensions to work at their best while incorporating an advanced energy absorbing crash structure, ready to protect the occupants in the unlikely event of an impact. The never ending quest for weight reduction resulted also into the combination of structural and non-structural or aesthetical elements. An example is the integration of all ventilation air ducts into the monocoque's structure, making the use of additional parts and ducts unnecessary. The result of this attention to detail is a vehicle weighing 1.350 kg making the Huayra the lightest sportscar in its class. Mercedes-AMG provides the heart for the Huayra. The 60 degree 12 cylinder turbocharged engine with a displacement of 5980 cm3 has been developed not just to meet the strictest technical and quality requirements, but also to give the car its many faces. The calm and harmony of driving one of the world's most refined GT car is interrupted when the driver calls upon the Huayra to unleash its 700 horsepower and 1000 Nm of torque. The turbos have been studied to offer immediate response to the slightest throttle input, giving the driver full control over the engine at any rpm and preventing unwanted delays in the delivery of power. The engine's systems have been designed and tested to stand up to the most adverse conditions of temperature and performance. The Huayra has been subjected to the highs of Death Valleyand the lows of the Arctic Circle. The two lateral radiators are positioned in the front to guarantee the best cooling efficiency of the intercoolers placed over the cylinder heads. Drysump lubrication ensures an optimal oil feed to the engine even when the car is subjected to the most extreme lateral accelerations. It also regulates the oil flow so that only the necessary amount of lubricant is actually pumped into the engine from the external oil tank, reducing the friction caused by an excessive volume of lubricant inside the engine sump. An oil/water heat exchanger reduces warm-up times by heating the engine lubricant during cold start and keeps engine coolant and lubricant levels at steady operational temperatures. Extensive weight saving programs led to ingenious yet simple solutions. In order to reduce hoses and connections as much as possible is built directly to the engine. The intercooler covers serve as expansion tanks to the low temperature circuit and the engine coolant circuit. The vertical fins contribute to the cooling of the tanks. The M158 engine is homologated to meet the strictest environmental regulations, EU5 andLEV2. 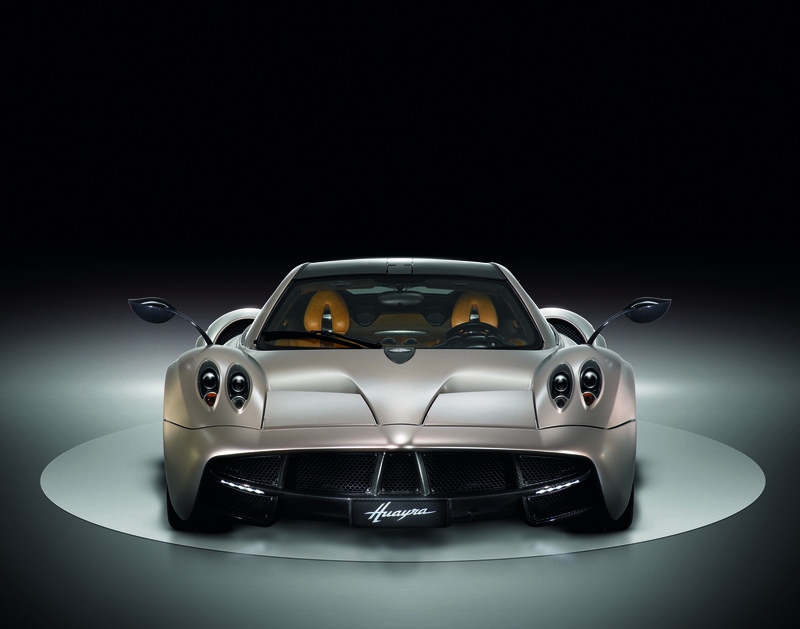 Despite the increase of power compared to the other Mercedes-AMG V12 engines developed for Pagani, CO2 emissions as well as the fuel consumption have been reduced, to make the Huayra class leading amongst 12 cylinder sports cars with values that are respective of much smaller vehicles in the market. The two stage fuel supply system features two microprocessor controlled pumps feeding fuel to the engine with the second pump only activated when necessary, thus reducing the energy required to run the fuel pumps and eliminates the waste of excessive fuel being transported and heated in the fuel lines. 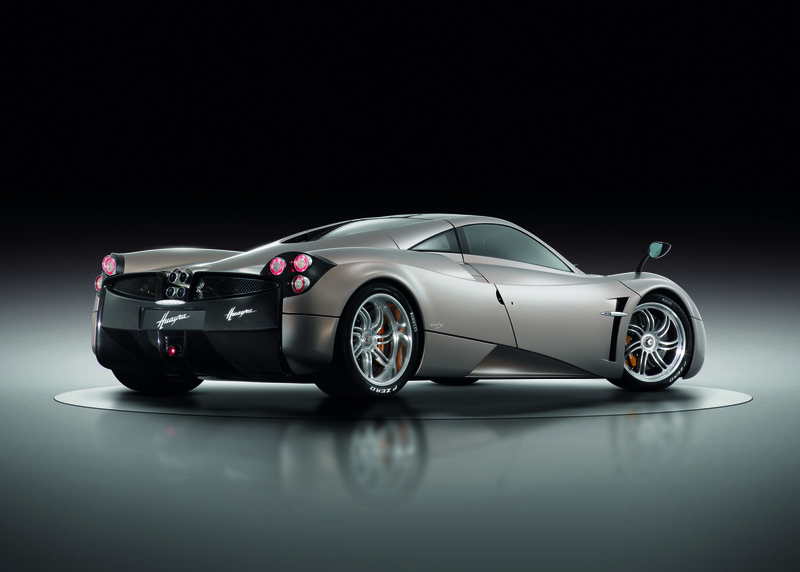 This efficiency combined with a large 85 liter fuel tank ensure Huayra's grand touring ability. As an homage to the decennial tradition of Mercedes-AMG in building world class sports car engines, the M158 displays the historic AMG emblem on the intake manifold alongside the name of the technician that assembled the engine by hand at the Mercedes-AMG headquarters in Affalterbach, Germany. The Titanium exhaust system has been engineered by MHG-Fahrzeugtechnik and is a direct application of race proven technologies on a high performance road car and the complete exhaust weighs less than 10 kg. Hydroformed junctions are used to reduce backpressure and guarantee a free flow of the exhaust gasses. Titanium guarantees a low weight in the muffler area while Inconel guarantees reliability on the parts of the exhaust more exposed to high temperatures. Careful attention has been paid to the tuning of its sound, which has led to a harmonic rumble at idle speeds with a hint of the power that lies hidden at low speed and a deep thunderous growl of motor and air, reminiscent of an airplane, at high speeds. 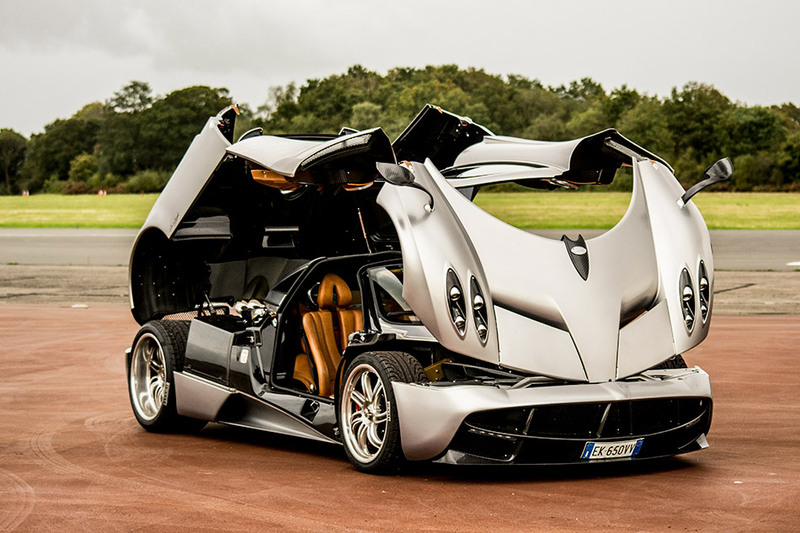 The power and prodigious torque generated by Huayra's V12 are transferred to the wheels through a transverse sequential seven speed gearbox and a dual plate clutch and the complete gearbox weighs only 96 kg. Keeping the weight of the rear overhang as low as possible has been a priority as we aim for a neutral behavior at the limit. A further benefit of this layout is a better behavior of the car during a rear impact. A dual clutch system was evaluated but ultimately not selected as it would have increased the weight by approximately 70kg, thus negating any minor improvement in shift-time. Xtrac already supplied the gearbox for the Zonda R and so it was the natural choice for the development of a new high performance gearbox. Xtrac's expertise in motorsports was obvious throughout the design and material selection processes that resulted in the strongest and lightest gearbox possible suitable for road use, with a synchromesh box that offers comfort levels a race car gearbox will never be able to offer. The suspension geometry has been designed to further enhance the sure-footed nature already present in the Zonda on the longer wheelbase Huayra. The individual suspension made with forged AvionAl double A-arms have been tested extensively on the Zonda R programme. Incorporated into the wheel hub assemblies are cooling ducts that connect directly to the support brackets, thus extending the reliability and lifespan of the bearings. Pushrod operated adjustable Öhlins shock absorbers keep everything under control and have been optimized for the dynamic requirements of the vehicle. Pirelli say "Power is nothing without control" and to assure complete control for the driver Pirelli has developed the bespoke P Zero tires, specifically for the Huayra. The Pirelli engineers were faced with a demanding task, combining road holding for excitement behind the steering wheel and lower rolling resistance to reduce CO2 emissions and fuel consumption. These PZero tires are built in a dedicated MIRS™ (Modular Integrated Robotized System) facility, dedicated to the production of ultrahigh performance tires and are at the forefront of what is technically possible, suited to top speeds above 370 kph as well as to lateral forces exceeding1,5 G.
The aerodynamic concept of the Huayra is that of a wing. The vehicle can modify the properties of this wing by varying the front ride height, which can be adjusted dynamically, and by adjusting the 4 control flaps on each of the four corners of the car. The goal is to have a neutral vehicle behavior under all conditions and control body roll via aerodynamic means. The behavior of the flaps is managed by a dedicated control unit that is fed information from the ABS and ECU, which pass information about the car's speed, yaw rate, lateral acceleration, steering angle and throttle position. The system improves aerodynamic efficiency in a variety of driving conditions, where a low drag coefficient is not the determining factor. During braking, for example, the rear flaps and the front suspension are raised to counteract the weight transfer and balance the weight distribution between front and rear axles, allowing a better use of the rear brake force. 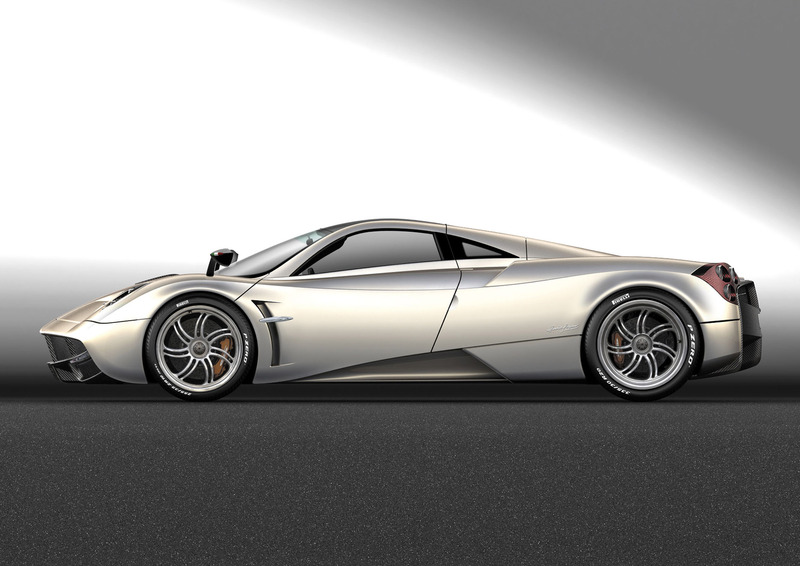 Another vital design tenant for the Huayra project was to ensure clean airflow over the body of the car. The shape of the two engine air intakes behind the occupants shoulders are a tribute to the supersonic aircraft of the late 1950s and 1960s, but also allow the motor breath without disrupting the flow. The intake for the gearbox radiator is located between the engine bay window and the carbon clamshell of the rear bonnet, which provides an excellent airflow to the radiator without having a substantial impact on aerodynamic drag. This decision also led to the omission of a rear wing, replaced by the movable flaps. The flow of air through the car was also carefully studied. The radiators are angled to contribute downforce and provide the best flow for hot air to be extracted. Air from the central radiator is extracted by vents on the front bonnet and trough the front wheelhouses. Air from the side radiators is channeled to ducts cooling the brake discs and wheel hubs. This air blows onto the brakes at a temperature of approximately 50°C warming the brakes up when cold and improving the first bite significantly. Lateral air outlets behind the front wheels generate a negative pressure inside the wheelhouse providing efficient extraction to lower the drag coefficient and generate downforce on the front. 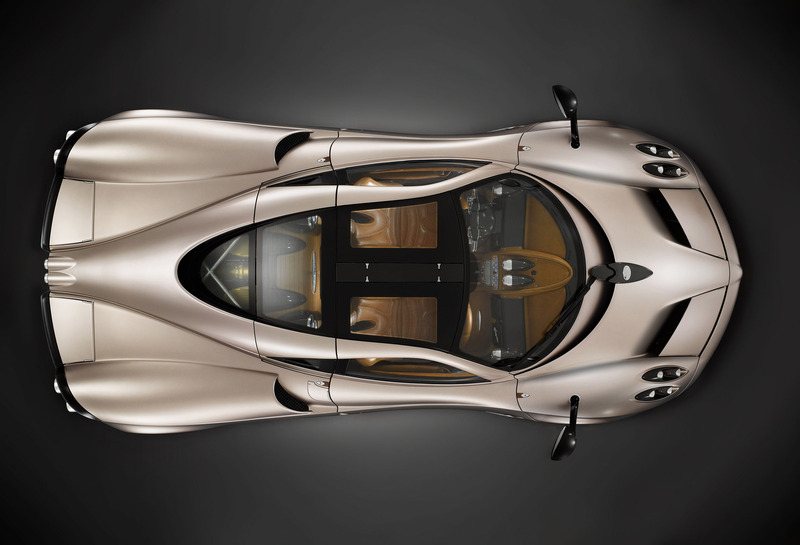 In addition to the downforce generated by the flaps and body, two high negative pressure areas were designed into the shape of the underbody and the diffuser at the rear, thus enhancing the aerodynamic stability and guaranteeing the Huayra downforce under all circumstances. As soon as the doors are closed the Huayra transports the occupants to a new dimension; aworld that pleases and surprises the senses. 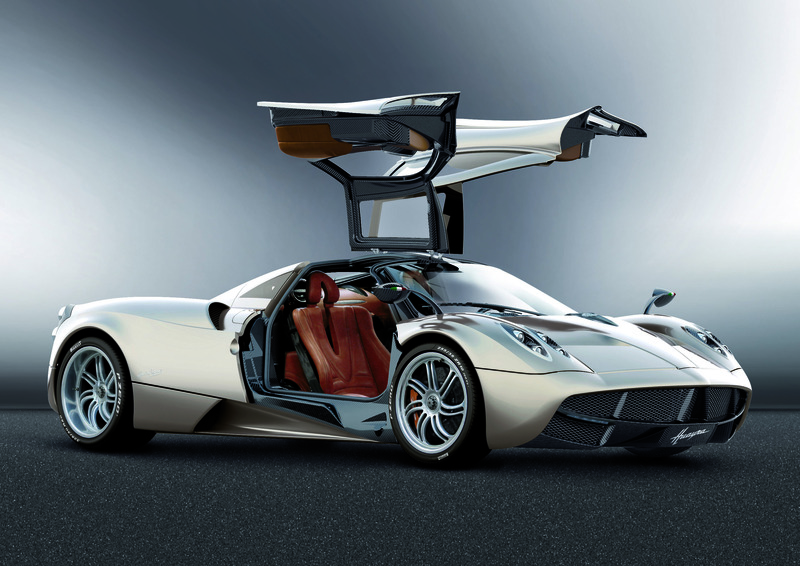 Having everything at arm's length is not closeenough for a vehicle with the capabilities of the Huayra. Consequently, the driver will find all primary functions directly on the steering wheel. The gearshift paddles are mounted directly to the steering wheel so the driver never needs to take his hands off the steering wheel. The seats provide both the comfort to make long trips enjoyable as well as the lateral support required when the g-forces build up on extreme driving. A Pagani is able to present drivers with state of the art solutions while still drawing on the rich history that precedes it. The ever present emphasis is on a living breathing being rather than a digital one. This can be seen in everything from the leather latches to the toggle switches, but this ethos finds its purest expression in the mechanical aluminum gearlever assembly, a monument to the art of the manual gearshift; progress that does not deny the past. The aluminum dashboard takes inspiration from the most complex swiss watch designs and includes a central Multi-Function Display displaying performance relevant information when SPORT mode is engaged and a trip computer when the COMFORT mode is activated. The aluminum center console is machined from one solid block of aluminum and features a clarinet style array of mechanical switches controlling the HVAC system. The high definition central touch screen is the heart of the vehicle infotainment system, controlling audio functions, satellite navigation, secondary vehicle functions and Bluetooth phone. To this date five prototypes have been built which have been conducting road tests for the past4 years. Currently, over half a million kilometers have been covered by our prototypes and before entering the US market we will have reached one million test kilometers. Each prototype has been assigned to a specific development task. At Mercedes-AMG one is used to develop drivability, and another is used for emission development. One car is operated constantly by Bosch Engineering for the application of ABS and advanced stability and performance enhancement systems. Still another vehicle is used for gearbox testing, and general vehicle dynamics development.